To skin a cat. 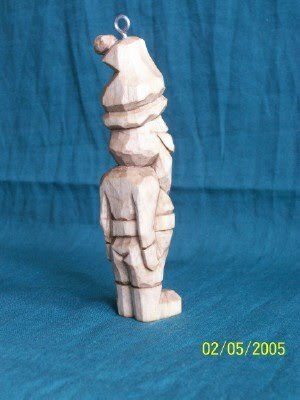 In Whittling, there are as many paths to a finished project as there are whittlers. I've filled this blog with my own steps on my path; one of the most important steps was learning to cut away enough material so my whittlings stopped looking like the block of wood they started out as I actually have two entrees on the subject, Apr 09 2010, Edgar Poe and the El Dorado of Whittling and Sept 21 2010, Evolution. I found another with a different approach I'd like to share. 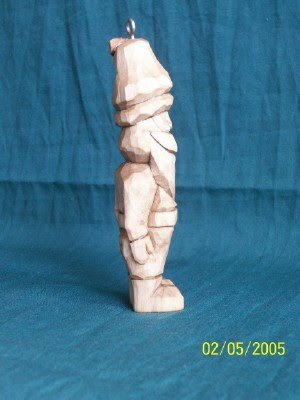 Eric Oswandel of Michigan is a member of the WoodCarvingIllustrated.com forum (Midnight Carver there). 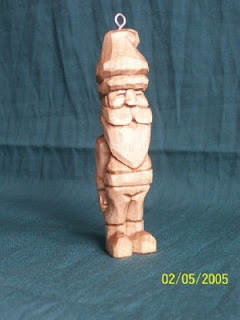 He was part of the Ornament Exchange 2010, he made the standing Santa here. There are some other features worth mentioning. Making eyes that appear to be smiling is not an easy thing, especially on an unpainted piece. Eric's eyes are simple rectangular chips- the smile comes from the cheekbones and the upturned mustache. Its a magnificent mustache, don't you think? would lay the Master stick next to the block to be carved to transfer the lines. 2. I painted the whole piece with several thin washes of burnt umber, keeping it wet, until I got the color I wanted. Keep in mind, the color will change when dunked in oil. Thank you Eric, both for the ornament and for sharing with us.